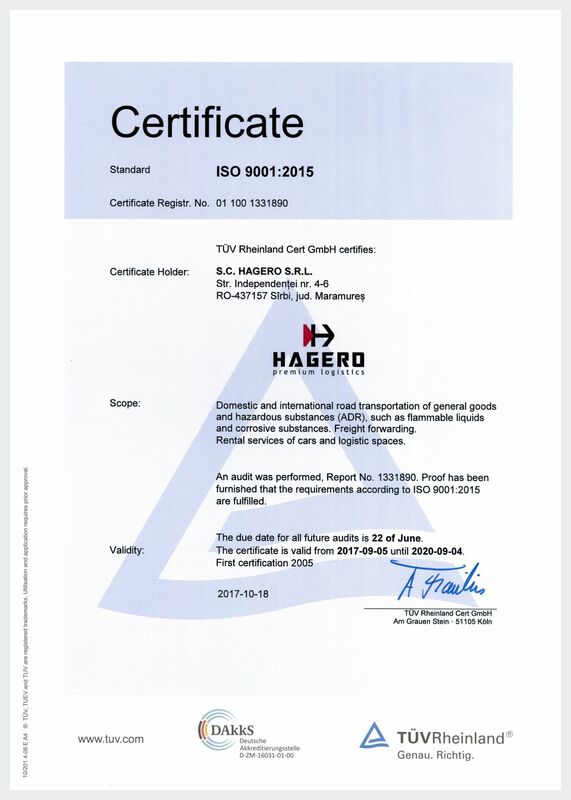 The high standard of service offered by HAGERO is doubled by the quality of its employees as well as by the confidence we put in our actions when providing solutions for our customers/partners. HAGERO offers a mix of services in transportation and warehousing, supported by a well-managed technical and management system, but also individual solutions that meet the customer’s requirements without compromise. The customer satisfaction and service quality are constantly in the spotlight at HAGERO. Our company was, the first international cargo transport company in Transylvania and among the first in the country to hold the ISO 9001:2008 Certificate. This recognition drives us to always be better and commit to the highest quality support for all our customers. Improve constantly the performance and quality of our services as well as the Quality Management System, based on direct observations and customers feedback. Provide training and continuous development of all employees to gain, maintain and improve the quality of the services we deliver.